NEW: *Add Optional $249 MieleCare 5 Year Extended Service & Repair Warranty Contract Performed by Miele Technicians in the USA for only $199 more! You can add to your order under "Recommended Accessories" below. AllBrands ships by common truck carrier—strapped to a 48x48" pallet to prevent any internal damage during shipping. Treat yourself to professional results and ironing in luxury with the Miele B990 rotary iron. This easy-to-use appliance utilizes a wide press roller, allowing you to press everything from shirts and pants to bed linens and tablecloths—all with a crisp, professional finish. The electronically-controlled roller speed can be adjusted to suit the type of laundry being pressed, as well as your own individual working speed. This function is easily operated through the use of a foot pedal, allowing you to sit and relax while you iron. Easy control of the device comes from the touch-sensitive foot pedal, a large bar built across the bottom of the B990 Rotary Iron for convenient access. This is the second Presser we have purchased from your company. We have been very pleased with the results we get from your product. Thanks again. I just love my new Miele Ironing Mangle! I have wanted one for years and years! After spending thousands and thousands of dollars on other people over the past few years, helping them out with bills and living expenses,(didn't do them any good) I felt I should spend some money on myself. I finally did myself a favor and bought one! It is very expensive, and that is what has stopped me in the past from purchasing one. But, I also have about 20-25 new sheet sets-- 100% Egyptian Cotton-and they must be ironed, as I refuse to sleep on wrinkled sheets, or have any of my house guests sleep on them. It was very, very easy to purchase this Meile Mangle on your website. I really appreciate your very, very, fast shipping too! AllBrands has become one of my favorite places to shop now! Thanks! Very happy with product. I look forward to some coupons to encourage me to continue to buy. My purchase was expensive, but quality is exquisite! Thanks. I am stunned that you could get this product to me in just 4 days! It was a heavy, large appliance. Additionally, I was stunned by not having to pay any shipping fees. The product is very satisfactory and the service was fantastic. We were totally impressed with our shopping experience and are thrilled with our new mangle iron, and hope to have many years of great ironing with it!. The whole process was so easy from start to finish. Thank you. My wife loves the unit. Wendy, the big advantage with the 34" wide German-made Miele Rotary Press is the foot-controlled continuous feed ironing, without having to move your fabrics around on an ironing table, and not having to move the iron shoe at all. It automatically clamps down on the fabric when pressing the foot control, and releases the fabric and shuts off the feed when you lift your foot off the pedal. AllBrands has sold over 300, mostly to B&B, nursing homes, resturants, caterers and institutions that have a lot of flat fabrics to press. There is nothing else like it on the market. 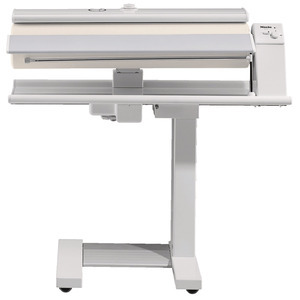 I would not recommend an ironing board or clamshell type press even it is is wider. No extra wiring is required on the Miele and it comes fully assembled ready to plug into your 110V power source. Thanks. John Douthat, owner and tech.